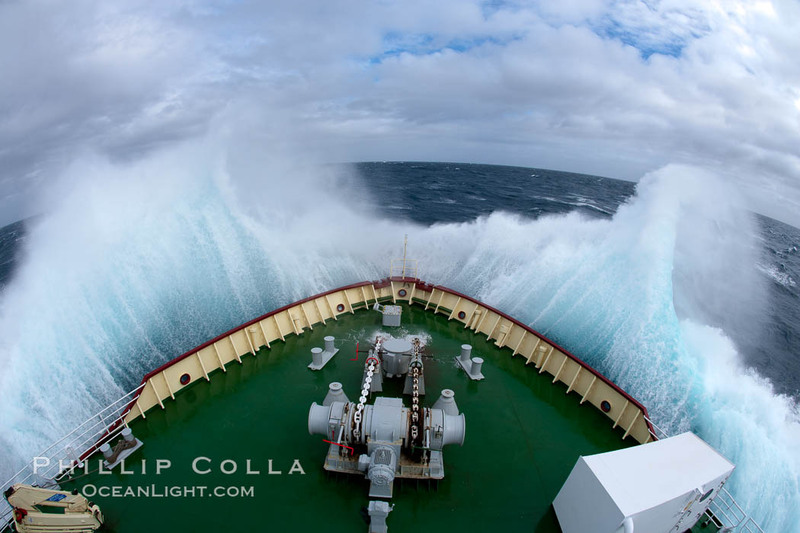 The Drake Passage is rumored to be the nastiest, meanest, toughest ocean crossing in the world. Many who round Cape Horn at the southern tip of South America relate the impressiveness of the Drake’s ocean swells. It is a crossing of the Drake, typically a two-day affair during which the Southern Ocean unrelentingly lashes a ship broadside, that affords one a full sense of how much the ocean can dish out. Or at least that is what I hear. In truth we did not experience much distress while crossing the Drake Passage from Antarctica to Tierra del Fuego. I think the swells topped out at about 5-8m (15-24′) on the second day, with a few that probably got up to 10m or so scattered throughout the day. The wind was a steady 25-35 knots, less than the prediction of a few days earlier had forecast. The real telling fact was that most of the passengers were present in the dining room for all three meals rather than in their bunks groaning and retching. Icebreaker Polar Star, bow plunging through high seas during crossing of the Drake Passage between South America and the Antarctic Peninsula. So, in hindsight we were comfortable, moreso than expected, and we did not really have a crossing of which we could boast. I spent some time on the forward observation deck overlooking the bow, trying to photograph green water coming over a bow that was sunk deep into an oncoming swell. In spite of my efforts I managed just two frames that show any significant water over the rail. As we gradually crawled north toward Ushuaia and our flights home, I thought about those seafarers of a century or two ago, those who braved the Drake Passage in small wooden boats, relying on sextant and grit to find their way, without any real knowledge of how far they had to go to reach “the other side”. Now those were men.